Just a quick question, what would be your recommendation on the best way to ship Acropora to minimise death when in transit for 14-24 hours. First the question, then a bit of detail about the tank. 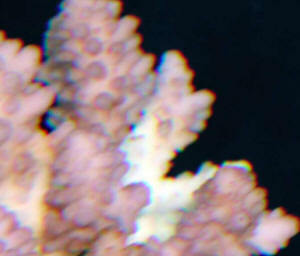 I have some purple Montipora digitata (see attached picture, not great quality sorry) that has been growing very well for the past six months. 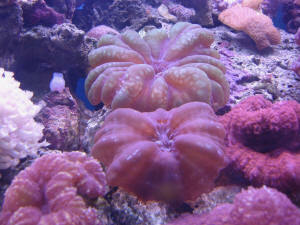 It is kept in the top third of the tank, in moderate flow and nearly directly below one of the 150 watt metal halides. I'd like it to be more purple. 1. What causes the purple color anyhow? 2. Is the lighting too much for it given its position in the tank? 3. Should I add more/less of some chemical? 4. Somewhat related, how much does light level really change in the 18" depth of a tank under the lighting I have (3 x 150 metal halide and 4 x 96 actinic)? In other words, will corals really feel a difference at the top, middle or bottom like I've read so much? I've given tank details in a previous email, but here are the basics. 125 gallon, live rock, mainly sps coral, 8 fish, calcium 450, dKH 7, salinity 1.025, ph 8.2, add iodide (Vibrance) 7 mL twice a week, strontium 50 mL twice a week, calcium 50 mL twice a week, Osmo-prep (1 tsp with 3-5 gal water change daily). Considering supplementing magnesium further, but don't have a test kit. Thank you for your thoughts/answers, here is a bit more detail... 1. You mentioned the purple color is influenced by light/food, and is a protection from UV range radiation. I believe most metal halide fixtures have UV filters in the glass/plastic. While I have no plan to do this, if we didn't have UV filters on our lights, would these colors be more pronounced (given adequate food/light) or are they pronounced anyway - in case they have a need to block the UV? 2 & 4. You mention light quality and intensity shift with depth, as I had always read as well. It would be interesting to see some quantitative research some day on light transmission of various light fixtures/temperatures/type at depth - as also compared to what those levels are in nature in various environments for the various corals. 3. Dumb question on my part, "should I add more/less of some chemical". I think I was getting more at "Is the purple color enhanced by strontium, magnesium, iodide, calcium, or something else?" It would seem from your comments that it is more food/light related. Also, a "duh" remark on the addition of magnesium - I certainly won't supplement until I test, but was also more a question of "Is magnesium related to color enhancement in this coral". but for how long and how much would this help them get at it? The LFS also mentioned "Fuel" and "Coral Accel" might be a bit redundant. I tried DT's phytoplankton for a while, but wow - fast algae growth, at least on the glass. Thanks for all the help, and I'll leave you be after this email. This is more about my tank and some lighting follow-up, but no particular questions that need to be answered. Oh, and a couple of pictures. You said: <Mr. Hoover>, but that would be my father - I'm just Jon. So, hello again. You said: <see Sanjay Joshi about lighting>, and you were right - http://www.manhattanreefs.com/lighting seems like a good starting point, but now I have to find out who manuf's the lamp and ballast in my Coralife Aqualight Pro 72, so I can look them up on his site. http://www.advancedaquarist.com/2008/3/aafeature2, goes a long way towards the goal with their charts and discussion on some research I'm doing before considering a Montipora undata for some time in the future. Also, I noticed your use of Cnidarian in both responses. From reading WetWebMedia, I should know "coral" gets way overused and doesn't really describe what's in the tank. Montipora digitata (2) and capricornis (2), Stylophora (1), Anacropora (1), acropora (2), Porites (1), Turbinaria (1), and Seriatopora (1). a maxima clam, and green star polyps. For posterity's (and, sure, pride's) sake, a couple of pictures are included (ignore the hood made of butcher paper, please). If I were to hear criticism, I'd expect it'd be along the lines of "some of that stuff is going to need to be moved eventually" and "a pacific blue tang, Foxface, and Bristletooth tang seem like they could pose a big bio-load for the future". Well, shoot, I was going to leave you alone, but you hit on the one thing I'm not really happy with in my tank - the rock wall design, given what I've got in the tank. I've got about 150 to 175 pounds of live rock in that 125 gallon tank. I've moved my Monti caps down lower and they seem happy there. Problem is that I seem to have a lot of my slower growing stuff grouped together, so I'm going to end up with one area full of growth and some other areas (the Acro's mainly) nearly empty with their slower growth. I've also got that center "cave/tunnel" from last year when this was going to be a FOWLR setup. Now, of course, it is a reef and that tunnel with the huge rock on it is wasted space. 1. keep the Monti caps low so they don't shade other stuff, and I want to add another Monti cap and a Monti undata. 4. the purple Monti digitata grow pretty fast, and I have two colonies. Separate them as they are now. 5. Stylophora, green. Big enough now to frag, and put on other sides of the tank. Top third of tank now, do they need to be there? 6. keep the xenias on their existing rock, frag and give back to LFS, remove all when SPS fills in. find something else that will "wave in the water", but is slower growing. 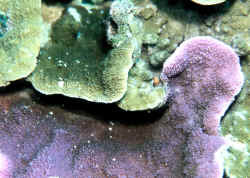 7. zoanthids, fine as is. 8. mushrooms, never seem very happy, not a lot of excess nutrient for them I've been told. 9. maxima clam, slow grower, but I hear could get very large. Not sure what to do. the tank, and his polyps get hidden by it. I've read he belongs in a cave, hiding upside down, but I tried some underwater adhesive and he won't stick. The tank is viewed from the front only, but I leave the top 4" on each side clean so I can view water clarity down the entire 6 foot length. I figure highest rocks in the back, lower in front, and arrange the livestock according to growth rates and light need. I need to consider water flow rate too I suppose. Pump is 1800 GPH, feeding 4 outflows plus 2 SQWD. Lighting is the aforementioned Coralife Aqualight Pro 72, with 3x150 DE MH, 4x96 actinic, 4 LED. MH is on 9 hours a day, actinic 11 hours per day, LED is 24/7. I've been considering upping the day length on the MH and actinic, and maybe using the LEDs more in phase with the actual moon somehow. I think I've learned more about lighting, livestock and water flow in the past week than ever before. Some day I'll ask your thoughts on Kalkwasser, drip feed, and top off equipment. Of course, I'm really not happy with how dry my protein skimmer runs, either, but that's a different topic. How have we gotten this far in, when my original question was care of my purple Monti digitata? Incidentally, 3 days of "extra feeding" has definitely improved their color considerably. This is very helpful, and I hope helpful to others eventually too. RTN? Please take a look at the attached photo (sorry about the quality). Tissue is sloughing off, I assume hermit crab is eating dead tissue and is not the cause. < I would say that as well. > Perused many comments regarding RTN on your site, is this what it looks like? This Acro has been in the tank for 6 months without symptoms and several other Acros look normal. About the only change recently is switch to Reef Crystal from IO. Have not verified all parameters yet, what I do know is pH 8.2, dKH 12, Ca 350, temp stable at 77-78*F. I guess my question is, if I do find something amiss and slowly correct it, what are the prospects for a full recovery? < Looks like a perfect example. Chance of recovery is very very bad. I would immediately frag that coral. I used to advise otherwise but every time I did the reefer would lose their coral. So now, I say frag many many pieces away from the RTN area and just hope the remaining mother colony makes it. Sorry I can't be more optimistic but I wouldn't wait this one out. > Regards, George.